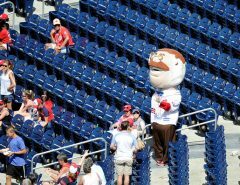 Last month, I dove into the Nats’ shaky start, a period that ended with Washington sitting below .500, performing well below expectations and nursing injuries. The latter is still true, but the team managed to put together an outstanding month of May as numerous replacements performed well above expectations, leading to a 19-7 record. The other key to this surge: outstanding starting pitching and a much, much improved bullpen. And the injured troops are steadily on their way back, at the perfect time. All stats are through May 31, courtesy of FanGraphs and Baseball-Reference.com. What sticks out here? Power. 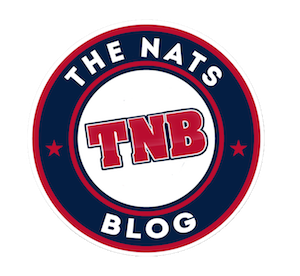 The Nats led the National League in homers for the month of May with 41, leading to a 41-point improvement in team slugging over the month of April. 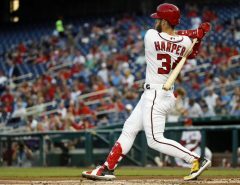 Bryce Harper unsurprisingly led the team with 10 dingers, while Matt Adams was not far behind with 9. Next on the list is Mark Reynolds, who has taken 6 balls out of the park in just 14 games (47 plate appearances). Talk about a big May addition. I have no idea what the Nats are going to do when Ryan Zimmerman comes off the disabled list, because carrying three first basemen seems counterproductive. One or two big power bats could end up on the bench – or one of Adams and Reynolds could be traded out of town. Anthony Rendon has rounded into form since coming off the disabled list, posting a 137 wRC+ in 22 games in May. Wilmer Difo, as I’ve discussed previously, continues to make outstanding contributions, posting a 121 wRC+ and providing spectacular defense. And of course, there’s the welcome debut of one Juan Soto, who has posted a .333/.415/.500 line in his first 41 Major League plate appearances. With Michael Taylor continuing to struggle (51 wRC+ in May), Brian Goodwin set to return and Adam Eaton making his way through rehab, the outfield is going to be log-jammed very soon, just like the first base position. My guess as to how the Nats handle this: Taylor only starts against lefties, with Goodwin rotating in against righties to give Eaton some rest as he returns from another extended absence. One last thing: I can’t wait for Daniel Murphy to come back. Here’s where the Nats made their hay in the month of May (sorry, I had to). I mean, wow. Literally first or second in every category here. This is an appropriate time to admire just how fantastic the Nationals’ rotation has been over the years. Having four pitchers that you can rely on for stable production in Scherzer, Strasburg, Gonzalez and Roark means the Nats are never truly out of any pennant race if all of them can get locked in at the same time. That’s exactly what happened in May. The offense was solid, but the Nats are not even sniffing first place right now without the rotation going all scorched-Earth for an entire month. Yikes – I didn’t even mention Jeremy Hellickson. 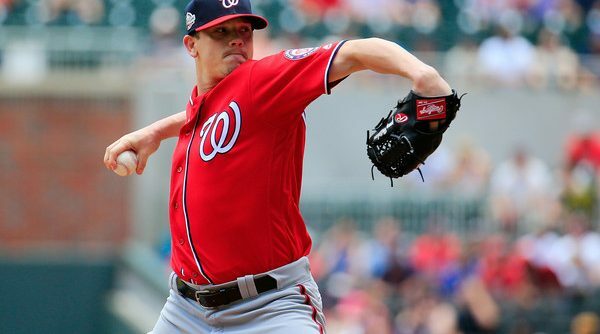 Like Mark Reynolds, Hellickson is a veteran who sat around waiting for an opportunity in spring training and is now contributing healthily to a contending team. In five May starts, Hellickson posted a 1.30 ERA backed up by a 2.69 FIP, with a ridiculous 0.65 BB/9 and a 0.65 HR/9. I highly doubt this will keep up, especially when I see the .246 BABIP against, but five starts worth of elite production out of Hellickson is something I never expected. – 63 strikeouts in 40.2 innings for Max Scherzer. Just give him the Cy Young already. – Just 3 home runs allowed by Stephen Strasburg in 32.1 innings, after surrendering 7 home runs in 39.2 innings prior to May. – 1.47 ERA for Gio, who continues to find a way to strand runners and limit damage. – 0.26 HR/9 for Tanner Roark. The crafty veteran may give up his share of runners, but limiting the long ball goes a long way to him being able to pitch late into games. This is where the Nats saw the most improvement from the first month. The bullpen finally stabilized, cutting way down on home runs and walks given up. Much like the lineup, contributions were made from unlikely places. Justin Miller and Tim Collins have made a combined 8 appearances and registered just 15 outs, but it feels like more than that. Miller is a journeyman who has somehow K’d 5 of the 8 batters he’s faced. Collins provides another lefty option beyond Sammy Solis, who was again relied on heavily in May, with 14 appearances. The duo helped bridge the gap to Brandon Kintzler and Sean Doolittle, as has Wander Suero, another call-up that pitched to a 2.70 ERA in 10 innings this past month. Speaking of Kintzler and Doolittle: their top-notch performances made up for the absence of Ryan Madson, who has now returned to the ‘pen after a DL stint. Brandon somehow navigated through a .432 BABIP for the month to post a 2.65 FIP in 10.2 innings. As for Doolittle – total dominance. 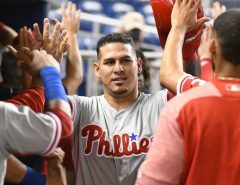 In May, a total of 2 runs given up in 12.1 innings, which both came in his lone blown save of the year on May 19 vs. the Dodgers. On the season, the bespectacled beast is second in reliever WAR. It’s about time the Nats had the closer position figured out before the trade deadline.